When Nick Ryan of Marquette Companies approached Dave Miller about doing a high-quality hospitality concept at Water Street, Dave did his homework. Over years of conceptualizing, Miller developed a plan to fill a need in the community. Now Miller is building Elements to serve Naperville for weddings, fundraisers, corporate meetings and more in the heart of Downtown. Elements will offer a beautiful contemporary, rustic-urban space accommodating from 50 for a meeting to 250 for a dinner-dance to 300 for cocktails. Menus will feature organic, chef-inspired, locally-sourced cuisine. 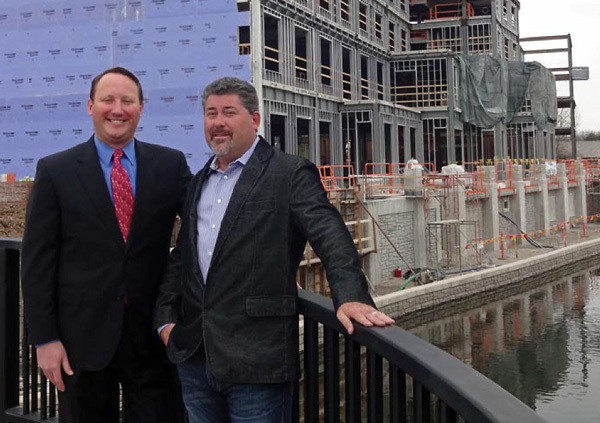 From Left, JASON NAGEL Naperville Bank & Trust, VP Commercial Banking; DAVE MILLER, Managing Partner, Elements at Water Street.